El Camino Real, the royal road, is a ten-kilometer cobblestone road in Colombia built in the sixteenth century, and I can feel nearly every one of those age-rounded stones as I bounce along in the back seat of Felipe and Elisa Madinan’s car. We’re about an hour and a half west of Bogota when we turn onto El Ocaso, another cobblestone road, and begin to climb up to La Palma y El Tucán, the couple’s farm. Almost immediately the temperature drops, and the flora along the road changes from untended wild shrubs to fruit and coffee trees. Felipe points out a thin tree the height of a small house and says it’s a fifty-year-old heirloom typica plant, an ancient titan of a coffee tree. Along with the lower temperature, there’s now a damp quality to the air and it smells of jasmine and coffee cherries and deep, rich earth. A thick fog begins to creep up over the road, and a dense cloud settles in overhead. It is immediately apparent why the Madinans chose this place to farm. Its unique microclimate stands in stark contrast to the warm, sunny areas of Colombia I have already seen on my trip. Felipe is a passionate visionary who emanates energy, and as we drive he tells me his history in coffee. 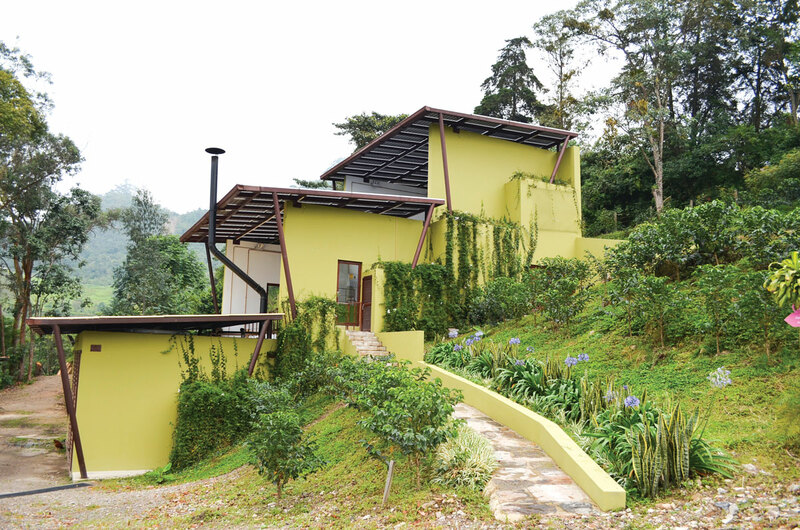 Before this farm, he was a successful importer and exporter of both commercial and specialty Colombian coffees. Then, in 2008, the market crashed, a few large companies defaulted on their debts, and his company went under. He returned to Colombia, intent on continuing in coffee. While he began to map out his vision for La Palma y El Tucán, his partner, Carlos Arevalo, who is a Q instructor and agronomist, began working on farming and processing concepts. Together they decided that if they were going to produce and export again, they had to do something different, something that was special. First and foremost, they would focus on specialty, and not just specialty coffee but literally the top one percent. “No more depending on quantity and small margins that have huge risks,” Felipe says. Felipe and Carlos looked at nearly fifty farms before they came upon an abandoned one outside Zipacon. Sitting at almost 1,800 meters (nearly 6,000 feet), its microclimate boasted almost constant fog and cloud coverage. The resulting colder night temperatures slow the growth of the coffee trees and thereby increase the time for the coffee cherries to develop sugars and organic acids. They bought the farm in 2011 and immediately began work. Few producers get to design their farms and planting new varietals is not a typical luxury. Usually, farms are passed down through generations, and what worked and grew before continues to work and grow. La Palma y El Tucán is fourteen hectares, but Felipe and Carlos decided to plant coffee on only eleven hectares and leave the rest to nature. First, they planted nitrogen-inducing trees in specific locations to help cultivate fertile soil. Native fruit trees and shrubs were planted to add even more nutrients to the earth. These also provided some shade that would aid the slow-growth environment they hoped to create. These plantings also attracted native insects and wildlife that contribute to the overall wellbeing of the farm. Carlos explained that robust animal and plant life is key to a successful specialty coffee farm. He believes it shows up in the cup and helps keep long-term environmental impact to a minimum. 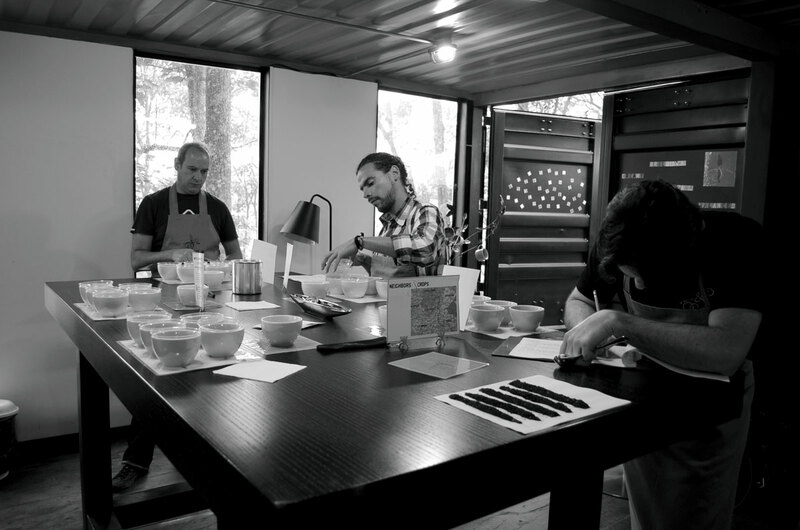 Carlos Arevalo and Felipe Madinan cupping on the farm. Finally it was time to plant the coffee. They split the farm into five sections based on varietals. Green-tip geisha, copper-tip geisha, yellow catimor, red bourbon, and SL28 were each chosen for their specific flavor profiles. Felipe explained how there was an excitement and slight fear in how some of these varietals would perform. SL28, known for being highly citric and phosphoric, is a common Kenyan coffee, but Felipe had no records for how it would perform in Colombia. This fearless, maybe headlong approach resonates throughout the project. We arrive at the top of El Ocaso. At the entrance to the farm is a large, new house built for the family that lives and works on the farm. Carlos is waiting for us there, and for a few moments we stand and look over the valley of coffee plots. Though I can’t see any, I hear birds, lots of them, and with the soft light through the fog, the valley is lush and green. Felipe fidgets, excited, as he waits for me to get a look at everything. Then he smiles and takes off into the forest to show me the farm. As we walk through a field of green-tip geisha trees, Felipe and Carlos keep saying, “We’re almost there,” but I’m not sure exactly what there is. Which is fine by me because I’m floating with joy in this sea of healthy geisha trees covering the valley. The large shade trees surrounding the plot cut out almost all sunlight that filters through the low cloud cover. I want to drink this coffee. I want to drink it now. “Where’s the cupping lab?” I ask. Up ahead a few rows from me, Carlos laughs. He stops and opens a door that comes from nowhere and a cupping lab appears out of the trees. “It has the Predator effect,” Carlos says. The lab is covered, ground-to-roof, in mirrors, and so the reflected geisha trees sway in mirrored-movement with the real geisha trees as a breeze sweeps over the top of the valley. It’s made of two large shipping containers that have been welded together with the adjoining walls removed. The main room features an oversized wooden cupping table in the center. A sample roaster resides in a pocket room on the left. Grinders and hot water towers sit on a bar on the length of the right side of the room. Out back, a deck boasts a view across the rest of the fields of geisha trees. 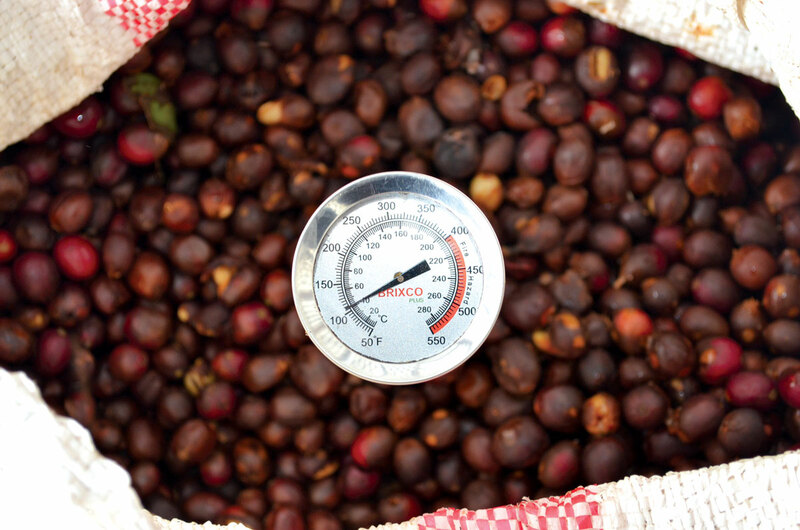 A temperature reading of coffee cherries. Then we proceed to cup some of the most amazing coffees. We taste four varietals that have gone through three different processing methods. 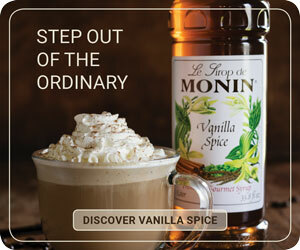 The coffees are extraordinary, but are still being refined. I hesitate to describe them too much because of this, but one thing that stands out is their confectionary-like qualities. They have large, sugar-laden lychee notes mixed with exotic melons. High amounts of phosphoric acid created mouthwatering, juicy aspects unlike those I have ever found in Colombia. Many walk the fine experimental line of tasting fermented versus complex but stay the course of tropical yet approachable. There are stacks upon stacks of notebooks and cupping forms in the lab, giving a small insight into the amount of research that has been done on the cupping front. The coffees represented in the cupping lab were both from La Palma y El Tucán proper and also from what they call the Neighbors Program. This program is a system of buying high-quality cherry at a premium from their neighbors’ farms. Their buying price begins at Fair Trade levels, and then they offer more for higher quality lots. La Palma y El Tucán processes these lots separately and labels them with the producer’s name. They give feedback on quality as well as growing tips to help the neighbors with their next harvest. They also donate new coffee trees grown in the La Palma y El Tucán nursery to participants in the Neighbors Program and provide organic fertilizer. It’s clear from the attention to detail at the plant level to the beautifully constructed washing mill and density channels that every aspect of the farm was meticulously planned in order to yield coffees that are in the highest percentile of specialty. Later in the trip, Felipe and Elisa took me to meet José Reyes, one of the farmers in the Neighbors Program. We woke him from a nap and after wiping the sleep from his eyes he grumpily agreed to show us his crops. His farm was the size of an average backyard in my hometown in Arkansas and was full of wild coffee trees. More than six varietals grew there and seemed to have no order. “Our neighbors had limited market access and little incentive for quality beyond quantity,” says Elisa. “Due to the high humidity, drying coffee is very hard in this incredibly unique ecosystem. Therefore, farmers would sell wet parchment, which sells at a penalty and discounted price.” Working directly with farms to increase quality, pay, and pride can have a big influence on coffee families. Simple things like having their name on the label in some of the most prestigious cafés in the world can actually make an impact. The hope is to bring back real economic gains and respect to coffee production in the region. We leave the lab and head to the washing station. There are many small, spring-fed creeks on La Palma y El Tucán, and the largest of these runs beside the wet mill. The green-painted mill is three stories tall, with vines and indigenous plants growing on the different terraces. Solar panels cover the roof and provide a third of the power used on the farm. Carlos shows me a circular water system they’re testing to reclaim, filter, and recycle the mill’s water. He then points to a large PVC pipe and explains that the pulp goes 100 yards down to a composting facility where it becomes fertilizer. Carlos and I walk back to the top of the wet mill, and he shows me the cherry selection process, which begins by measuring the brix level of each lot. Once the lot has been approved, it is taken to the main tank to be pulped and sorted. The pulped coffee then flows through four beautifully built Kenyan density channels. In each channel a wooden board is set at a specific height in the water. As the coffee flows through the channels, the denser coffees travel below the board and the less dense coffees get stuck or float above. Those floaters are scooped out, and removed from the lot. 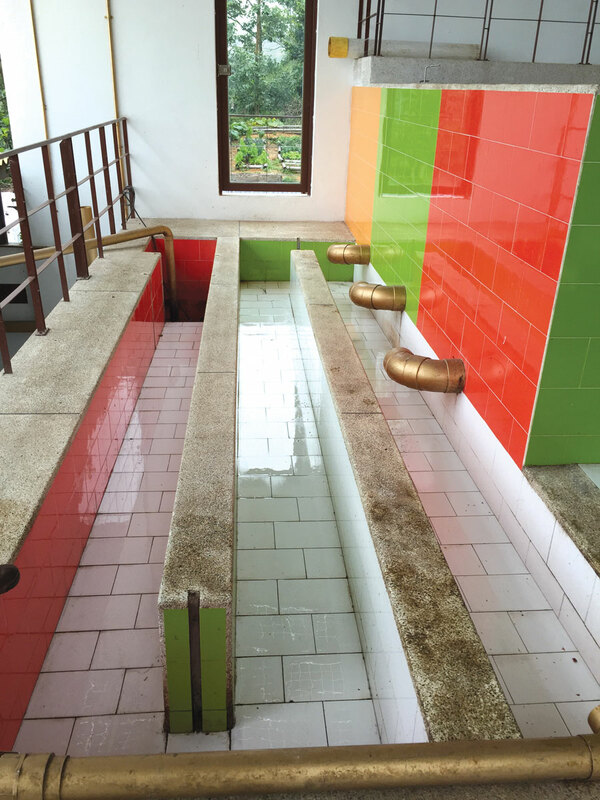 Traveling with clean water they then go into three divided water-filled fermentation tanks beautifully constructed of yellow, green, and red tiles. There are three different tanks to help with volume or lot separation depending on what coffees they are milling. The washing station at La Palma y El Tucán. To me it is already clear from the attention to detail at the plant level to the beautifully constructed washing mill and density channels that every aspect of the farm was meticulously planned in order to yield coffees that are in the highest percentile of specialty. And all of this is just the prelude of the processing stage, before the real magic happens during fermentation. There’s no denying the impact processing has on the cup. Natural processing can bring out huge fruits and sugars, while washing can yield crisp, complex flavors, and so forth. Felipe and Carlos are doing something unique. La Palma y El Tucán has developed two processing techniques they call lactic acid processing and acetic acid processing. By manipulating temperature, using anaerobic or aerobic tanks, tweaking pH levels, and influencing other factors, the processes encourage the growth of certain bacteria, which in turn create either lactic of acetic acid. For the lactic acid process, the coffee is sorted by density and stored in a tank. The pulped coffee is then placed in a large, black, food-grade plastic bin about the size of a small hot tub with an airtight lid. A small tube with a one-way valve is attached, allowing oxygen to escape the bin but prohibiting air from coming back inside. Now, during the forty- to sixty-hour fermentation process, bacteria produces methane, which fills the container and pushes the oxygen out. This anaerobic container encourages faster growth of lactic acid bacteria. Next, the coffee is placed into a tiled reservoir filled with clean water to undergo a second, twelve- to twenty-four-hour wet fermentation. The time varies for each batch depending on the moisture content and temperature of the outside air. After fermentation the coffee is moved to plastic-covered, raised, African drying beds. The beds have moisture meters built into the tent and a fan that controls the moisture level inside the beds. The coffee is dried to twenty percent moisture content. Finally, the coffee is moved to mechanical dryers to remove another eight percent of the moisture. The dryers run on coffee parchment recycled from the dry mills. The acetic acid–processed coffees are prepped in the same way. Where the process diverges is at fermentation, when it goes directly into the tiled reservoir. It then ferments for thirty-six to forty hours, and the key here, Carlos explains, is to use cold water to keep the pH level high. Otherwise a fermented, fruit-vinegar taste appears in the coffee. Most washed methods, he explains, can’t sustain that long of fermentation. The coffee is also agitated every ten hours. After the fermentation process, the coffee is dried in the same manner as the lactic acid–processed coffees. 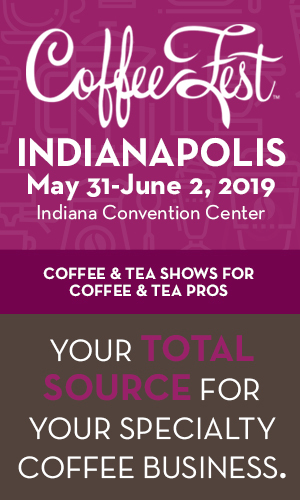 Both of these new processing methods, it should be clear, produce a perfect situation for bacteria to have a dramatic effect on the coffee’s cup profile. After spending the weekend with Felipe, Elisa, and Carlos, I began to really understand the meaning behind the name La Palma y El Tucán, (the palm tree and the toucan). Both are becoming endangered in Colombia and need each other to thrive. The analogy to producer and roaster has become evident to me after visiting. 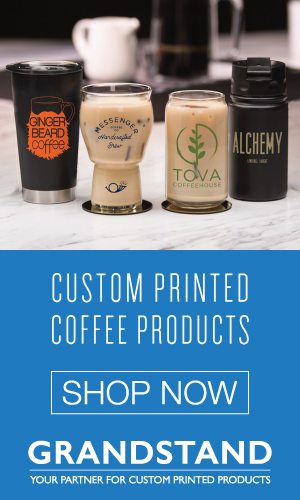 It takes progressive, educated risk takers to make this new breed of specialty coffee successful. 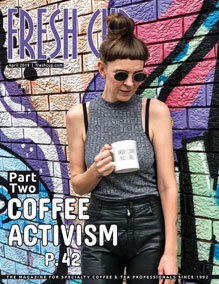 —Story and photos by Jon Allen, owner and green coffee buyer for Onyx Coffee Lab, and a regular Fresh Cup contributor.